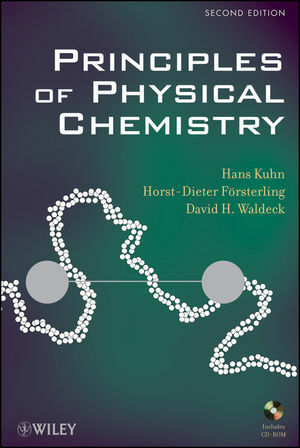 Principles of Physical Chemistry, Second Edition uniquely uses simple physical models as well as rigorous treatments for understanding molecular and supramolecular systems and processes. In this way the presentation assists students in developing an intuitive understanding of the subjects as well as skill in quantitative manipulations. The unifying nature of physical chemistry is emphasized in the book by its organization - beginning with atoms and molecules, and proceeding to molecular assemblies of increasing complexity, ending with the emergence of matter that carries information, i.e. the origin of life, a physicochemical process of unique importance. The aim is to show the broad scope and coherence of physical chemistry. HANS KUHN, Dr. phil, became a Professor at the University of Basel in 1951. From 1953–1970 he was on the chair of the Institute of Physical Chemistry at the Philipps-University at Marburg, and in 1970 he became Director at the Max Planck Institute for Biophysical Chemistry (Karl-Friedrich-Bonhoeffer-Institut) until he retired in 1985. Professor Kuhn has published papers in such fields as polymer science, quantum chemistry, organized molecular assemblies, and the origin of life. HORST-DIETER FÖRSTERLING, Dr. phil., was a Professor in the Department of Physical Chemistry at the Philipps-University of Marburg from 1972 until his retirement in 1999. Professor Försterling has taught physical chemistry courses and laboratory courses at all levels, including graduate and advanced graduate courses in spectroscopy, statistical mechanics, reaction kinetics, and quantum mechanics. His research interests include quantum chemistry, reaction mechanisms, oscillating chemical reactions, and chemical waves. DAVID H. WALDECK, PhD, is Professor and Chair in the Department of Chemistry at the University of Pittsburgh. Professor Waldeck has taught chemistry courses at all levels, including graduate and advanced graduate courses in statistical mechanics, reaction dynamics, and quantum mechanics. His research interests include condensed-phase reaction dynamics (homogeneous and heterogeneous), solute-solvent interactions (structural and dynamical characteristics), relaxation processes in solids, and electron transport at the nanometer scale. 2 Essential Aspects of Structure and Bonding. 5 Atoms and the Variational Principle. 6 A Quantitative View of Chemical Bonding. 7 Bonding Described by Electron Pairs and Molecular Orbitals. 8 Molecules with π-Electron Systems. 11 Nuclei: Particle and Wave Properties. 13 Solids and Intermolecular Forces. 14 Thermal Motion of Molecules. 15 Energy Distribution in Molecular Assemblies. 16 Work w, Heat q, and Internal Energy U. 17 Reversible Work wrev, Reversible Heat qrev, and Entropy S.
18 General Conditions for Spontaneity and its Application to Equilibria of Ideal Gases and Dilute Solutions. 19 Formal Thermodynamics and its Application to Phase Equilibria. 22 Reaction Equilibria in Aqueous Solutions and Biosystems. 23 Chemical Reactions in Electrochemical Cells. 25 Transition States and Chemical Reactions. 29 Origin of Life: Matter Carrying Information. Discussion of solids and nanoscale materials (quantum dots, nanotubes, etc).